In productivity circles the process of task management has been hashed over and over again. Whether you are using cloud based solutions, large enterprise tools, or personal constructs, everyone at one time or another has had to deal with the process of capturing tasks, tracking, executing, and reporting on them. Since I’m such a fan of the Springpad platform (yes, I call it a platform because it is just that flexible) I thought I’d take a long standing technique for managing tasks related to time and translate it into the world of Springpad notebooks and springs. The method: Merlin Mann’s 43 Folders. In a nutshell, 43 Folders focuses on using a tickler methodology for managing tasks and actions. There are 31 folders - one for each day of the month, and 12 additional folders, one for each month in the year. As you move through your day and identify things needing to be addressed you capture the item on a note and place it into the corresponding folder for when the “tickle” will be most effective. For example, if you have a bill due on the 15th you place the bill in the folder for the 12th and deal with it then. 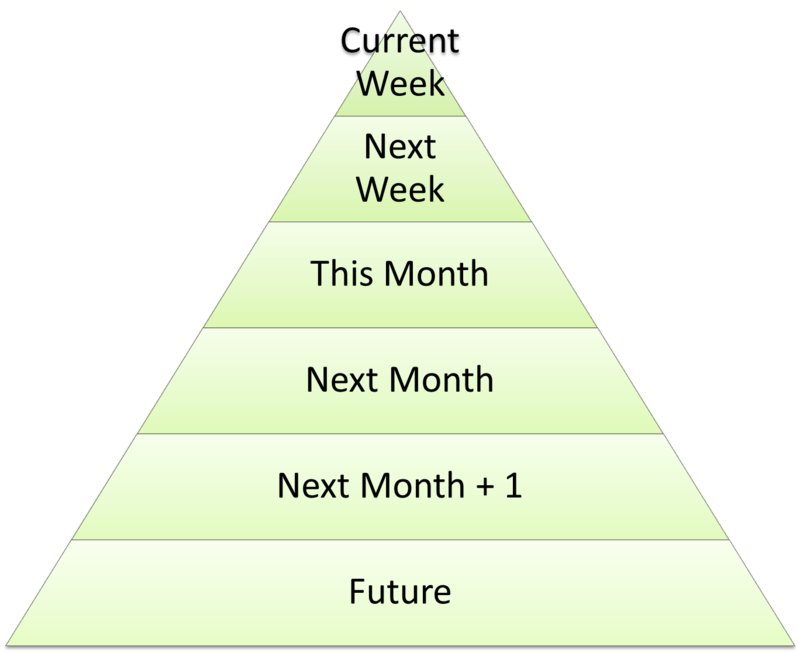 In cases where you have something for a future month you just place it in the month folder and when that month comes around you transfer the contents from the month folder into the corresponding day folders. Simple enough. 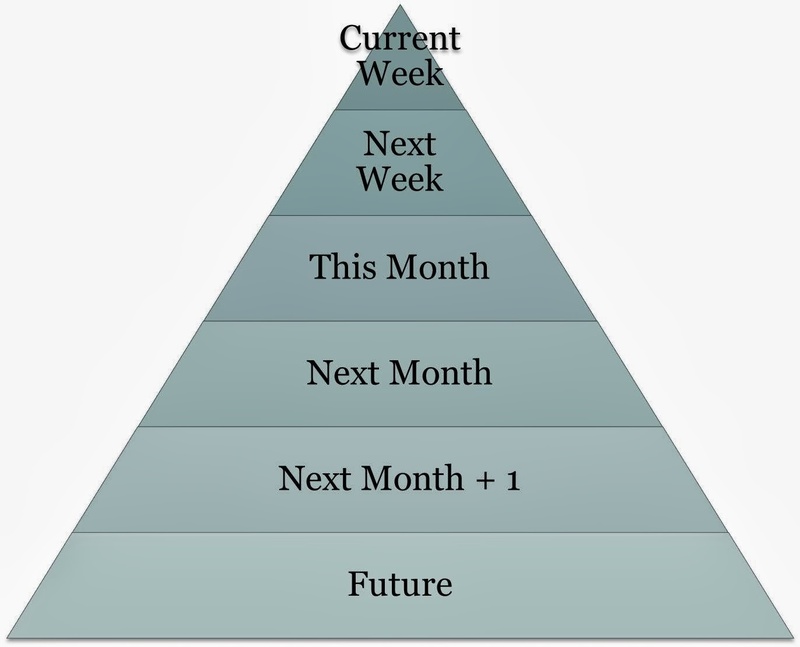 Now the folders for the months are actually named with the month, but for the purpose of this graphic it was important to show you have three months of coverage before jumping out to the "future." This also gives you an idea as to the volume of content in each folder that would be reasonable. Remember, you are trying to focus on what you can get done right now and not lose track of what is to be done in the future. Idea Pump Tip: I move all the task folders to the top of my listing of notebooks so that they show up right away regardless as to if I am using the web or my Android device. Starting with the notebooks, and since this example is for work rather than personal, you can see I have two notebooks assigned: Current Week and CorasWorks. Current Week is the notebook of everything expected of me this week and CorasWorks is the name of the company for my day job. Now what is important about this is that I assigned both. Springpad allows you to add items to multiple notebooks and remove them from one without removing them from the others. In this case my task exists in the Current Week (expectations) folder as well as my CorasWorks (work history) folder. Where the strength of the system comes from is when I complete the task this week. 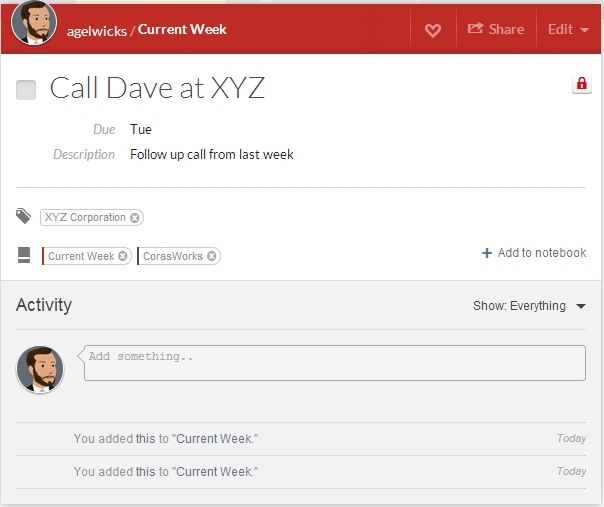 Once the task is finished, I mark it complete using the checkbox, add any notes I need into the Activity field, and remove the Current Week notebook connection. By dropping the current week notebook I still have a record of my task in the Company notebook while keeping my Current Week notebook clean. This technique works just as well for non-task items that need to be "scheduled". I frequently add shows to watch or things to read into my notebooks so I make a point of getting to them. If an item is for the future reference, just mark it with the correct notebook and when you do your scheduled reviews move the items from one notebook to another. Idea Pump Tip: When emailing items into Springpad, you can attach more than one notebook parameter to the subject line. If I have an email needing to be addressed this week and I'm in a hurry, I'll forward it to my Springpad email address and append @CurrentWeek and @CorasWorks to the subject line. Using the Springpad notebooks as a top level of organization for your content gives you flexibility and structure at the same time. Try it and see if this process works for you. Comments, questions and feedback are welcome and if you find this useful, please share it on your social networks. Thanks from the Idea Pump!